Hydrangea are one of my favorite flowers. Last summer I planted twenty hydrangea bushes. The varieties are Endless Summer, Limelight, All Summer Beauty, Little Lamb, Nikko Blue, Greenspire and one climbing variety. I love their country elegance and their larger than life blossoms. I'm not sure what variety these are, but like the Limelight variety, they have beautiful pale green blossoms. I have to trim the stems almost daily to keep them smiling. Perhaps because the blossom heads are so large. This variety has smaller blossoms and doesn't need as much trimming. I've had these for about two weeks now and they're still very bright and fresh looking. I can't wait until my hydrangeas are blossoming. Many have started to leaf out but I'm afraid blossoms are still many, many weeks away. But they're so worth the wait. They're beautiful flowers aren't they? On this side of the world ours have finished and we have a very long wait until they next bloom. It's worth the wait though. I'm looking forward to planting a few daphne bushes in the meantime so that I can have lovely winter perfume. 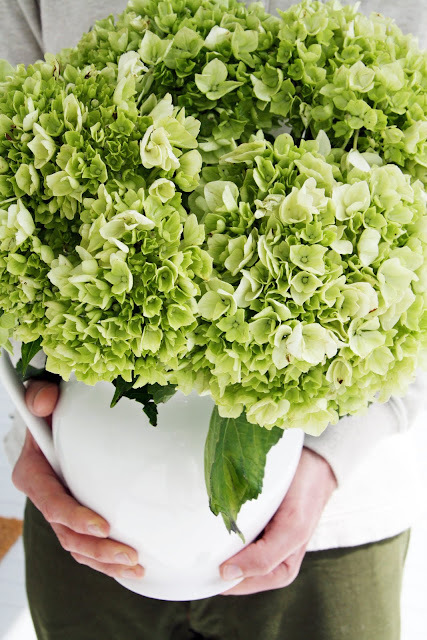 ooooh I love green hydrangeas. Do you know that if you fill the bath with cold water before you pick your hydrangeas and then hammer the stems so they are split then pop them in straight away ( push the whole lot under the water, flower, leaves and stem) leave them there overnight. They should then last about three to four weeks with occasional water top up or let the water dry out and the flower head will mostly dry too and then you have beautiful dried hydrangeas? That was a long question. My mother had 30 hydrangea bushes and we always had them in the house. This is her treatment give it a try! Oh yes - that's life! hydrangeas are a favorite here too -- I'm planting some new ones this year! And I love the blossoms when they dry -- I love the color and texture and they keep vases filled during the winter. I agree Trina - love hydrangeas, particularly green flowering. Mine are looking very sad here after a long hot summer. They're ready for a sleep! So many varieties! I love hydrangeas but have always had that at the houses that I've lived at so I've never known all of the types. They are easy to care for and see to provide 3 seasons of blooms with the greener early color, the full-color of summer blooms and the softer, deeper color of the fall. Wonderful as dried flowers too. I remember as a child having a huge bush just outside of my bedroom window... magical. We are still weeks away from seeing buds on our hydrangeas but I can't wait. They are one of my favorites too. Aren't they the most gorgeous blooms and that colour is the best! I'm not a fan of articial flowers but was tempted by some similar to these recently. Only problem was they were $13 a stem. I just wish we could grow them where we live but it's too hot. You will have a constant supply once they are flowering. ENJOY. I love hydrangea too and would like to plant one that keeps the dried blossoms on all winter. Your photos are amazing - especially the one with the bread and cheese. Gorgeous lighting to highlight gorgeous flowers. i can't wait until your hydrangeas are blossoming either because i know that you will post GORGEOUS photos of them. happy spring! I love hydrangeas, there is just something about those big billowy blossoms! One of our neighbors has some very old Nikko Blue bushes that are breathtaking! I had no idea there was a climbing variety! I love,love,love hydrangeas. My favorite is the Pee Gee hydrangea with its beautiful white flowers that fade to pinkish in the fall. They make a beautiful ornamental for the garden and are easy to grow here. I also love the image of pretty blue hydrangeas against a backdrop of softly weathered cedar shingles, something we see often here in coastal Maine. I can't wait to see your mass planting of hydrangeas~ I know they will be breathtaking! And, you have inspired me to plant some more hydrangea bushes in my yard this summer! Happy Gardening! You had me at "H"....love them all too! The minute mine start blooming, I'm like "Edward Scissorhands" cutting away! Love to hear how you make out with the climbing variety. I took mine out last year when it took over the side of the house and bloomed very little. A gardener, I'm not! What beautiful photos! I, too, love hydrangea, and can't wait to plant lots of them in our new garden! :) Happy Spring! Hydrangeas are by far one of my most favorite flowers...they're so big and vibrant and gorgeous when they are dried. These are beautiful! I bought several this year that I need to plant. I do love the green though! I love hydrangeas too. These are gorgeous!!! I just posted a pic of the hydrangea that I planted yesterday. Every year I try one in the garden, but they are so hard here in Houston with the sun and hot temps. I just adore hyndrangeas and yours is gorgeous! What no Easter bonnet pics? I love hydrangeas too. I'm looking for a particular heirloom variety that starts greenish and ends up with blushes of burgundy. I don't know what it's called. I planted a climbing variety last year on my arbor called Brookside Littleleaf that supposedly only gets 10-15 feet tall. It's now about five inches tall so it'll be a few years before it blooms. Can't wait to see photos of yours...and I hope you kept track of which is which. I too love hydrangeas. I was just in my garden all weekend and was looking at my hydrangeas bushes thinking I can wait until they start to bloom. I hope to see photos of your huge selection. Oh, I love hydrangeas! They're so beautiful. I hope to put out one this year, but to have twenty! Ahh, a girl can dream! Enjoyed your post this morning! I too love these flowers. I enjoy all colors. We planted about 10 last year and have not seen them yet blossom. They have started to bud but can't wait to see the result. Now that we've fenced part of the property we are deer free around the house. Last week I removed the wire cages around the two hydrangeas and decided that I need to buy several more plants - I love those big mop-head blossoms, or the lacy fairy cap ones. What other flower looks as good dried as fresh? my favorite too! I planted a measly (compared to your 20!) last year, but more are in the works for this year. Mine are leafing out nicely and I am chomping at the bit for them to bloom! I've seen the smaller green variety called Pee Gee. so lovely! Oh my, how beautiful. Limelight is my favorite. Love the gorgeous color and the huge heads. I have several hydrangeas in my yard but blooms are a loooong way off. Like you, I adore these flowers. We are moving in October to an apartment with two small gardens, and I plan on planting mainly hydrangea and lilac. Beautiful! I love hydrangeas as well. In fact, the centerpieces at my wedding were simply 5 or 6 full blooms in a glass vase. No fillers or other flowers. Simple yet stunning. Beautiful pictures. I too had some blossoms in the house that I bought at our local Trader Joes. I have many plants in our yard as well, and cannot wait for them to blossom (ours are just leafing out as well). I love the fact that while you may plant one color, what actually blossoms might be entirely different do to the soil conditions. I love surprises! Hydrangeas are my absolute favorite flower...so naturally I gravitated towards this post with delight. Wow! To have 20! Amazing and how fun! I have 3 bushes but they are still quite small. Last year I finally got a few small blooms on my blue bush, which is my favorite. They are very dear to me because 1 my mother gave me when I was engaged, another when I was married, (both blue) and the third my husband gave me during our first year of marriage (a pink one). I used blue hydrangeas in my wedding 3 years ago and loved loved it! I ADORE hydrangeas too! I especially love them paired with ironstone and silver. So you have satisfied me today! Thank you very much for that. Mine are also just a bit of leaves on woody stems right now but I cannot wait til they bloom. Hydrangeas are my favourite too. ... and they dry to nicely, you can enjoy them all year long. They are one of my absolute favorites, too ( as you can tell from the name of my business and blog). They reming me of home, of coastal New England. On Martha's Vineyard, all the old homes have white picket fences lined with large hydrangea bushes--just gorgeous! Those hydrangeas are beautiful... how nice to be able to enjoy them this time of year along with the tulips and daffodils and they look extra gorgeous surrounded by all of your exquisite finery. Hope you had a lovely Easter! Did the pretty bonnet make an appearance? The front of our home is lined with Annabelle hydrangea. They are enourmous and dry beautifully. I hope to plant many more this year. They seem to do better in our soil than the Nikko Blue. I did learn an interesting tip from an organic gardener in our area to help promote blooms on hydrangea.. he told me to dig a mote(sp?) about 2-3 inches deep in the soil around the plant, pour Epsom salt in the mote and cover...Early Spring is best. It did give me more blooms last year so I am doing it again this year! Good Luck with all of yours!! I cannot wait to see more gorgeous photos! A sweet hello from Frog Hollow Farm. Hydrangea - I think they are the most elegant flower and can't get enough of them! How wonderful to have 20 bushes to watch bloom this year! Can't wait to see those photos! Ciao, bella! Hello. They are beautiful - we have lots of 'maiden' ones which never fully flower - they are shy - hence the name. Hydrangeas are the most beautiful flowers in my opinion. I live in Kansas and tried to grow a red variety and they all died, I planted 8. Then I found out they do not fair well here due to the climate....so sad. At least I can look at yours! 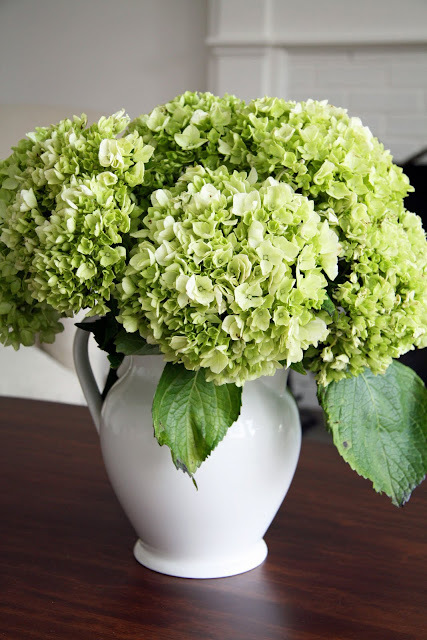 I think Hydrangeas are such classy flowers and add style to any room..
Gorgeous! We live in the worst gardening zone in the country (Zone 2) I think. Nothing is green in our garden except the bergenia? (elephant ears) which stays green. My hydrangeas bloom in September, so it is torture to see everyone's before that! Hope all of yours flourish! I have Endless Summer hydrangeas that are still blooming into April autumn here in Australia. Love the green ones though. Hydrangeas are my favorite. Unfortunately they are a favorite of deer too. Those sweet creatures ate mine down to a stub! One day, when I live by the ocean, I will have hydrangeas, a country house by the sea is just the thing for me. Daily walks, sand in my sheets and masses of hydrangeas out my door. yes i love hydrangeas too as they make a great long lasting cut flower. We are very lucky as they grow like weeds where we live and have them just about all year round! Hydrangeas are my favorite of all time!! They remind me of my mother. Such lovely images. I love them too!! Once I saw a Westport with bright blue Hydrangea around the entire porch, it was breathtaking! Hydrangea's are my all time favorite too (tulips and sunflowers are next). I don't know what variety is in my yard, but they dry without shriveling up...I can't wait for the new crop this year so I can have more arrangements of dried ones in my house! I love hydrangeas ... they remind me of my grandmother's peaceful garden. We planted several of them in our garden, white and pink ones, and Endless Summer, too. Can't wait wait to see them blossom! P.S. 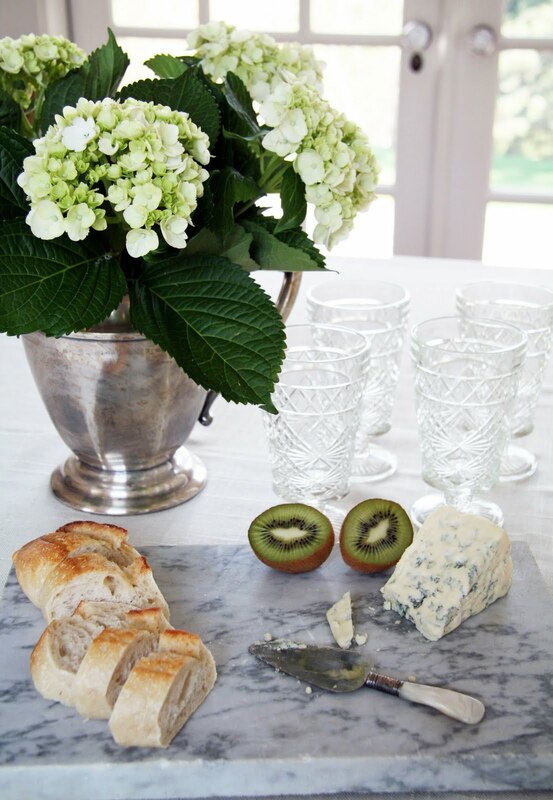 : I love the picture with the silvery jug and the glasses and cheese. So fresh! Beautiful! I don't have any on my property. Will have to plant some. I love your photo shot with the cheese and kiwi. That is picture perfect! Limelight is my all time favorite hydrangea! Hi Trina! We don't have any hydrangeas on the property at present, but I plan on changing that this spring!! My goal is to landscape around the house itself, and I want big white hydrangeas on one side! Hope all is well;)! Hydrangeas are so romantic. Your home must be fabulous when all of your plants are in bloom. I think they are graceful and friendly- so willing to be cut, arranged and even dried. I dry mine and use them in my Christmas tree and this fall I used some old dried ones that had turned brown in a huge urn with pheasant feathers. Your photos are magnificent! Love them! It wouldn't be summer without hydrangeas would it now?! My favorite is the Anna belle, but we have several varieties including nikko, oakleaf, pee gee, and endless summer. I'm dying to try the limelight...that green is gorgeous! Your blog is always fun to visit! I've started to root some more from my blue hydrangea. I bring them indoors too. 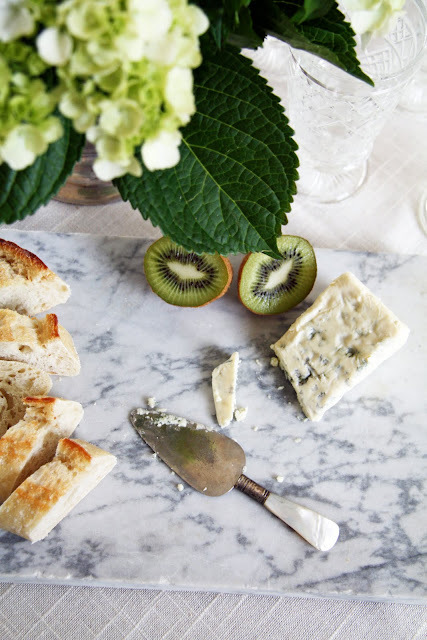 Gosh your blog is driving me CRAZY- it's beautiful! Your home is a dream! Love this post.. hydrangeas are so lovely! Hi Trina, I am new to your blog, and from the looks of things you certainly have many commentators.... so, just wanted to let you know that you can keep hydrengas alive longer, by submersing the flowers in a tub of water for an hour or so, that will make them come back to life, and will make them last for many, many days!! ....they are my favorite as well! I fell in love with hydrangeas when I was a little girl. My grandmother had one just outside the guest bedroom where I slept when I visited. Absolutely divine! They are my all time favorite. I feel as though they are a small part of me. My bridesmaids carried the Nikko Blue variety at our wedding & I carried another variety. We planted the Limelight variety at our first home. Now we are purchasing a new cottage home in a small historical rivertown in Iowa, where we are from & I can not wait to line our property with hydrangeas.